Sabrina saw this post on A Year of Crockpotting and thought it would be a great idea to make it for dessert this evening. Conveniently, we had everything on hand so it was super easy for her to get it going. We set the timer for 30 minutes - my crockpot is large so I warned her that it would cook faster. 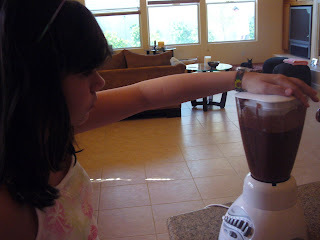 After everything was hot and melted I helped her pour it into the blender. 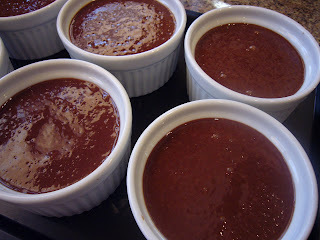 It didn't "puff up" as much as we thought it would, but she poured it into ramekins, rapped them against the counter to remove some of the air bubbles, and chilled them. Wow - it's very dense - not puffy like a regular mousse. 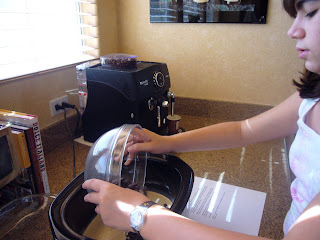 She really enjoyed making it this way, it was certainly different than the traditional method - and if you need a good chocolate hit, this is the way to go! Thanks Stephanie! We look forward to trying more of your great ideas and recipes! In your crockpot, add the heavy cream, egg yolks, sugar, vanilla, and coffee. Whisk until combined. Add the two cups of chocolate chips. Cover and cook on high for about an hour, or on low for about two. 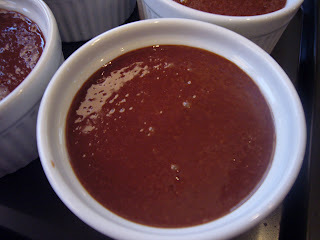 (Ours took 30 minutes) You are looking for little bubbles in the surface of the cream, and melted chocolate. Stir to combine the liquid and melted chocolate. 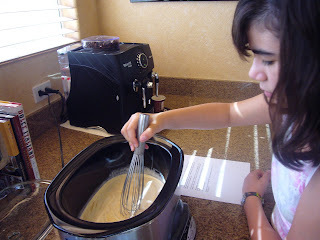 Very carefully, pour the mixture into a blender. You'll get about 2 1/2 to 3 cups of liquid. Blend on high until it "grows" to about 5 to 6 cups, and doesn't seem like it will rise any higher. Pour into serving dishes, and chill for 2-3 hours, or until set. What a good idea. Wonder if I can get my boys to try this.